The verdict is a win-win for everyone: for those who want to adopt legally as for those who want to follow Muslim law. 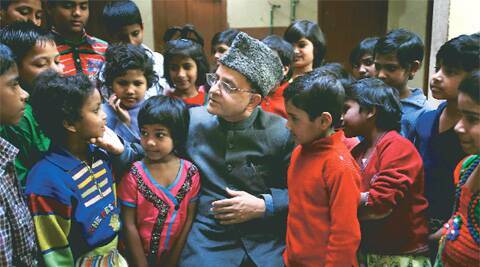 Zafar Mehmood with children from his orphanage Happy Home in Delhi. On a sweltering day in May 2012, Mohammad Sajjad, who teaches at Aligarh Muslim University, and his wife Nargis, a homemaker, had no time to fret over the weather. After almost a decade of marriage, they finally had a baby girl, and they had to make arrangements to welcome her home. They were informally adopting the baby, born to Nargis’ brother and his wife three and a half months ago. Although both the couples had agreed on the adoption, Nargis’ sister-in-law dithered after the delivery. However, she came around in three months. “At that time, we told them to think about their decision carefully, but they seemed sure,” says Sajjad. But the dream was to last only about two months. In July 2012, when the biological parents came back to claim their daughter, Sajjad, 42, and Nargis, 37, were devastated. “It was extremely traumatic for us, but we could not do anything because we had not legally adopted her,” says Sajjad, who did not opt for legal adoption even though an Amendment to the Juvenile Justice Act in 2006 had allowed Muslims to do so. The Amendment defined the word adoption to mean that the adopted child is “permanently separated from his biological parents” and becomes the “legitimate child of his adoptive parents with all the rights, privileges and responsibilities that are attached to the relationship”. Until then, Muslims or Christians could not legally adopt children. Last month, on a petition filed by activist Shabnam Hashmi regarding the legal status of her own adopted daughter Seher, the Supreme Court clarified that the definition of adoption, as mentioned in the 2006 Amendment, was not binding on Muslims (or Christians). The verdict is a win-win for everyone: for those who want to adopt legally as for those who want to follow Muslim law. Since Muslim personal law doesn’t allow adoption, Sajjad and Nargis had thought that they did not need to follow the legal process. Now life has opened another window and they don’t want to take any chances. “My sister is now willing to give us her third child, a girl, but this time we want to make her ours legally,” says Sajjad. Muslim law only allows couples to become guardians of orphan children or to sponsor their education. “The word ‘adoption’ is a modern term, and is not allowed in Islam. But taking care of children is, in fact, encouraged by the religion,” says Syed Zafar Mehmood, president, Zakat Foundation of India, who himself “adopted” a five-year-old boy, but by remaining his guardian in accordance with Muslim law. For him, taking care of an orphan child will earn him a place in heaven, as the Quran promises. “He is a 26-year-old doctor now. He lives separately, but our relationship remains the same,” says the 53-year-old, who has three children, the youngest of whom is as old as his adopted son. A former government official, Mehmood runs three orphanages, two in Delhi and one in Bahraich, Uttar Pradesh. Adoption is not allowed in these orphanages, but families can sponsor the children’s education. Guardianship under Islam comes with three primary riders. First, the adopted child cannot marry his blood siblings, but can marry the siblings of the adoptee family. Second, once the child becomes a major — 18 for boys and 21 for girls — the guardianship ceases. The third, and the most controversial clause, is that the adopted child has no right to inherit in the adoptee family. However, the adoptee parents are free to gift up to one-third of their property to the adopted child, says Mehmood. For most parents, it is not so much about inheritance as it is about the self-respect and emotional stability that adoption entails. “If Seher — now 18 years old — is legally not my child, she would have to leave the slot of parents’ name blank when filling forms. How would she feel?” questions Hashmi, adding that once she turns 21, the people closest to her would technically become nobodies. When Hashmi adopted Seher on September 2, 1996, she was two days short of completing a year. The activist was unhappy with just the guardianship status even then, and filed a petition in 1997, but withdrew it after a few years. She refiled the petition in 2005. “We argued from the point of view of the child. It is not the decision of the child to be adopted by parents of a particular religion. For example, if my daughter was adopted by a Hindu family, she would have got all the rights of a natural born,” says Hashmi. Hashmi calls the law an “enabling one” since it is not binding on Muslims. “It’s like the Special Marriage Act, under which couples belonging to different religions can get married without having to go through any religious ceremony,” says Hashmi. Her decision to adopt a child was initiated, in a way, by her son Sahir, a nine-year-old at the time. He came home one day complaining about a particularly aggressive classmate. Hashmi then told him to befriend the classmate to find out why he was so aggressive. “What he found out was horrific. His classmate was an adopted child and had seen his biological mother being killed in front of his own eyes,” remembers Hashmi, who went on to adopt a child to “complete our family”. melted right then,” says Alam, who divides his time between Mumbai and Hyderabad, where his wife and daughters live. Alam, 42, and Katju, 44, are still guardians of their elder daughter Sara Aparajita, who is 12 now and was adopted in 2001 from the Missionaries of Charity in Hyderabad. But when they adopted their second daughter, Rewa Anahita, in 2010 —she is three now — the adoption law was in place through the 2006 amendment of the Juvenile Justice Act. They do not want to change the status of Sara to that of an adopted child now because of the legal and administrative hassles involved. Alam points out another technical problem with guardianship. “If the adoptee parents were to die, the guardianship reverts to the state and can’t be transferred to other relatives, which is the case with a legally adopted child or a natural born,” says Alam, who says he has “put things in order” for Sara.